Janet has been our Practice Manager since January 2013. 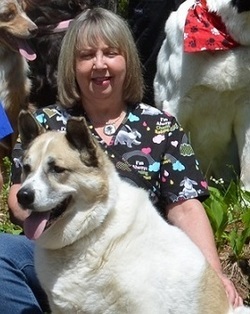 She started working in the veterinary field in high school and has over 30 years experience. Janet resides in Eagle River with her husband Jeff, son Liam, cats Quinn and Kisa, her dog Rylee Coyote and her horse Kid. A graduate of the University Wisconsin River Falls with a degree in Animal Science she also holds a certificate of Veterinary Practice Administration through the Veterinary Management Institute series at Purdue University. Janet enjoys spending time with her family enjoying the outdoors and loves hiking, biking and horseback riding. She has completed over 30 marathons, 4 Ulta-marathons and has participated with Team in Training for the Leukemia and Lymphoma Society. Janet holds memberships with the Wisconsin Veterinary Practice Association (WVPMA) and the Veterinary Hospital Managers Association (VHMA). Amanda is a Certified Veterinary Technician (CVT) and has been with All Creatures since March of 2015. She is a graduate of Globe University of Wausau in Animal Technology. Before going to Globe University, Amanda studied at the Art Institutes International of Minneapolis for 3D Animation and took general courses through Nicolet Technical College. Katie is a Certified Veterinary Technician (CVT) & a true animal lover. She began working at All Creatures in 2013 as our surgical technician. She also does clinical care for patients. Katie is very close to taking her certification exam to earn the title Certified Veterinary Technician and studies veterinary medicine during her “spare time”. Katie is a valued member of the pet care team at All Creatures. ​She has a bachelor’s Degree in Animal Science with Equine Emphasis from U.W. River Falls. She is an experienced horse trainer and worked with a professional horse trainer for a year in Merced, California. Jean joined us in the spring of 2018. She came to us all the way from sunny California!! She has a long history in veterinary medicine. She began her career in 1995 & has enjoyed every second of it. To top it off, she has a special interest in animal dentistry (LUCKY US!!)! On her off time, Jean enjoys her time in the Northwoods, spending time w/ her husband, her animals & reading. Susie has been with All Creatures since 2013. She is both a receptionist and veterinary technician student. She loves working with animals both large and small, and has a special interest in animal behavior. Susie and her husband Jeff have a small hobby farm that is home to a wide variety of "rescue" animals. Candy is a Certified Veterinary Technician (CVT) and has been at All Creatures since 2012. She has been in the veterinary field since 1999. Candy energetically maintains continuing education in her fields of study as well as her special interests in animal behavior & training. One of her favorite things is hosting/teaching our annual spring puppy socialization classes!! Contact her here at ACVC for more details. She also is the creator/administrator of our website, Facebook page & Youtube channel. Linda has been with All Creatures since 2009 as one of our warm and friendly receptionists. Answering the phone, scheduling appointments and greeting each and every client with a genuine smile are just a few of the things you will find her doing. She is also very good at offering helpful advice for your animals. Linda is known here as the clinic's "positive reinforcer", supplying endless treats to each and every patient. During her time away from the clinic she enjoys baking, hiking and fishing with her husband, D.J. Together they have raised two boys and love spending time w/ them & their Labrador Riley. Linda's favorite things about this job is that she learns something new every day! 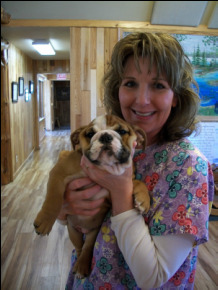 Tracy has been working at All Creatures Veterinary Clinic since 2005. Most clients see her working the front desk, but she can also be found working in the back on some days. Tracy is often found walking her dog Ozzie on the local back roads or playing with their cat, Charlie. When Tracy has free time she likes to spend it with her husband Jim and visiting her daughters, Shelby and Kelly. Like many of our Northwood's families, they love to spend time outdoors - kayaking or fishing. In addition to working at All Creatures, Tracy makes jewelry, some of which is on display the the cliniic. She also enjoys cheering for the "Brew Crew" and the "Pack". Sandy is our newest team member. She began her journey with us in 2018 & has become a valuable asset to our front desk staff. Sandy has loved animals her whole life & is excited to be part of our team here. She enjoys spending time outdoors & with her family. ​Terrie joined All Creatures in 2008, shortly after her and her husband Al moved to Minocqua from the Chicago area. They own an Akita rescue, Hoshi. Terrie handles all of our computer needs, accounts payable and is our Webmaster. Terrie retired after 37 years in Systems Development and is very happy to be working at an owner-operated office after working in Corporate America for so long. Terrie and her husband Al thoroughly enjoy their new Northwoods lifestyle and seeing wildlife in their backyard daily. They both enjoy exploring the beauty of the Northwoods, fishing, snowmobiling and entertaining their Illinois friends and relatives who love to visit. Terrie has taken up kayaking too and really enjoys it!